Axle Housing, front 4 wheel drive. Fits Case 570LXT, 570LXT Series 2, 580L, 580L Series 2, 580SL, 580SL Series 2, 580M, 580M Series 2, 580SM, 580SM Series 2. Replaces 144453A1. Same as 427107A1. 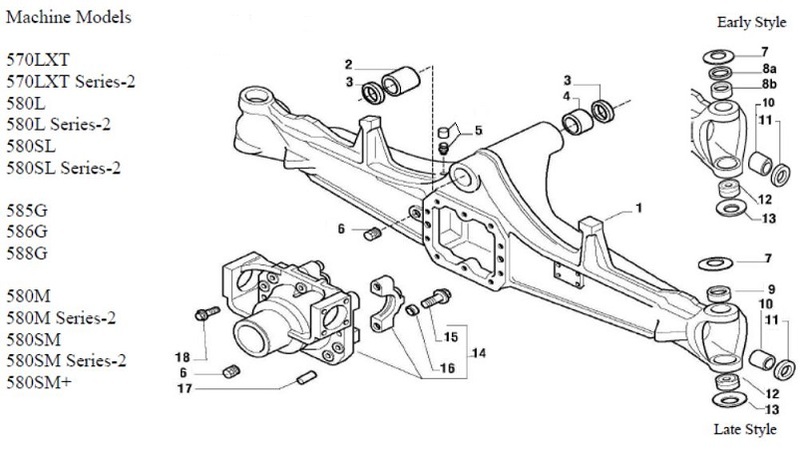 Bushing, front axle housing rear pivot. Bushing, front axle housing front pivot. Fits Case 570LXT, 580L, 580SL - Series 2's, 580M, 580SM Series 2, 585G, 586G, 588G Forklifts 4WD axle. Carraro 2616 Steering Drive Axle. Plug, drain - M22x1.5. Fits Case 570L, 580L, 580SL, 580M, 580SM 4WD tractor loader backhoe. Case 585G, 586G, 588G 4WD forklift. Carraro 2616 Steering Drive Axle. Bushing, upper axle at swivel. Fits Case 570L, 580L, 580SL, 580M, 580SM 4WD loader backhoe. Case 585G, 586G, 588G 4WD forklift. Replaces 100522A1 & 136990A1.